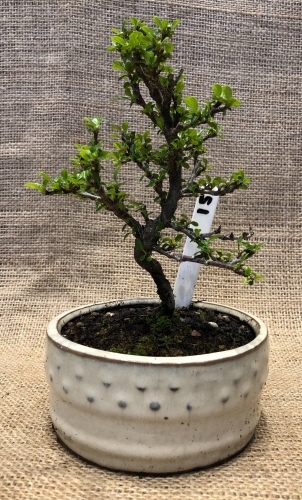 Shohin size Cotoneaster imported from Japan. This is a fantastic species for bonsai with it's small leaves and fine twiggy growth. This tree will withstand some frost and should be kept outside year all round. Protection during the worst of the weather can be done by bringing into an unheated room, shed, greenhouse or garage. If maintained correctly this tree will flower. The tree sits about 15cm above it's bonsai pot and is about 10cm wide. The pot measures 11.5x5cm. Free U.K. Mainland Shipping (Excludes Highlands and Islands) See our Shipping Info Page for E.U. shipping prices & please contact us before you order for an accurate shipping quote. Then use our postal vouchers to pay for shipping. Bonsai tree's can't be shipped outside of the E.U. - Outdoor bonsai need to be placed outdoor all year round. They need the change of seasons. - This tree will withstand some frost. -The plant can be placed both in a sunny and in a partially shaded location. The sunnier it is, the more water it needs. - This tree is a flowering bonsai. - This tree is a deciduous tree meaning this plant sheds its leaves during the winter months.